Celebrating the 50th anniversary of the 1966 Chevrolet on RT 66! 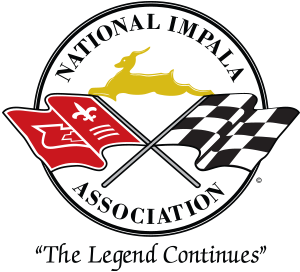 The National Impala Association will be hosting the 36th International Convention July 18 – 22, 2016 at the Crowne Plaza Hotel, Springfield, IL. Rooms start at $119.00 per night. You can download the registration form or book your hotel rooms now by clicking the links at the bottom of the page or by calling: 877-834-3613. Be sure to ask for the National Impala rate. We have booked a block of 75 rooms after which reservations will be on an “as available” basis. They will honor the $119.00 rate for us up to June 20, 2016 if any rooms are still available. We are responsible for a minimum number of rooms in addition to a minimum for food and beverage at the hotel so please plan to stay at the host hotel and attend the Banquet. The NIA will be responsible for the difference if we don’t meet these requirements so let’s get registered as soon as possible. Springfield is the Capitol of Illinois so they get busy in the Summer. There are all sorts of things to do in the area, RT 66 goes right through town, Abraham Lincoln lived and practiced law in Springfield so there is quite a lot of history to explore. They have an airport and an Amtrak station in town for those who may not be driving. We will be back in Spearfish, SD July 16 – 21, 2017 so mark your calendars! The next Newsletter is in the works and will be out soon. I’ve had to put the convention mailings on hold until the magazine is finished. Once that’s done, I’ll get the judging sheets, awards and photos finished and into the mail.